To celebrate the return of many Bryant Park summer programs, and to introduce our readers to our fantastic partners, we asked our partners to write guest blog posts. This post comes from Jeremy Hubbell of CK Chu Tai Chi. Two decades ago, Grandmaster C.K. Chu unveiled Eternal Spring Chi Kung. 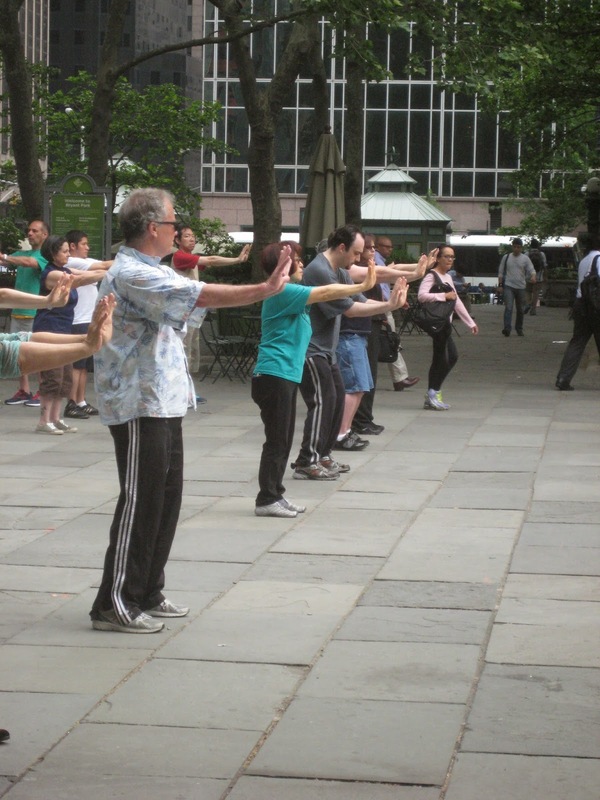 In 2003, his non-profit organization, the Tai Chi Chuan Center, created a program of free summer classes in Bryant Park. Now in its 12th year, twice a week 7:30am Eternal Spring classes have become a staple of Manhattan’s Midtown mornings. Classes are attended by as many as 70 people and, in this way, thousands of people have learned Eternal Spring. Meanwhile, there are certified teachers in several states and it is even part of a curriculum at the University of Bridgeport. The Tai Chi Examiner, Violet Lee, wrote about it in 2010 and in 2013 it was listed as one of the most interesting workouts by the Huffington Post. While not the only program of its kind to reach so many people, Eternal Spring is uniquely suited to helping anyone improve their health through its simple program of ancient chi kung principles. Tai chi practitioners start their morning right in 2014. Master Chu was once asked if there was an end to practice - if you could ever reach a point of not having to practice. "No," he said, "you must always move and use the body and so you must always maintain the body." How? By moving the body correctly the tai chi way. Eternal Spring is a program in reestablishing the body’s integrity - best done in the morning to tune yourself up for a better day. "Eternal Spring" is a shorthand for longevity - like a spring of water that is never exhausted. But also, it never ends. Since it feels so good and we feel so good doing it, why would we want it to end? It is something we should all be doing, everyday, so that everything else we do, we do better.